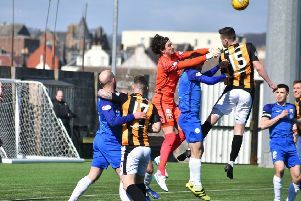 East Fife manager Darren Young praised his side's workrate. It’s a cliche, but the fact East Fife are now disappointed to be beaten by teams like Partick Thistle in the latter stages of cup competitions shows how far this side has come. Barely a couple of seasons ago the club was suffering relegations and battling to escape the nation’s bottom division, while cup campaigns were halted at the early stages. Now, the side is still scraping to get out of the league they’re in, but this time it’s to reach the Championship. Cup runs continue into the new year, with a semi-final on the horizon and with it the chance for the Fifers to reach a domestic cup final for the first time since 1953. On Saturday afternoon the Methil side again went toe to toe with full-time Partick Thistle. Boss Darren Young quite rightly pointed out post-match that, during large spells of the game, it was impossible to tell which team was full-time. East Fife started with an attacking 4-4-2 formation with Anton Dowds and Rory Currie deployed as a front two. They took the game to Thistle and came close to opening the scoring when Liam Watt nodded a Currie delivery narrowly wide. Thistle have no doubt improved since the previous meetings between these sides and posed problems inside the Fife box. Aidan Fitzpatrick went close to breaking the deadlock when he worked space for himself inside the Fife area and fired a shot towards goal which Brett Long smothered. East Fife had the better of things in the opening half but failed to really make the most of their dominance. To their credit, Thistle improved after the break, helped in no small part to the swift substitutions made by boss Gary Caldwell. He introduced Blair Spittal and Chris Doolan from the bench and they provided the visitors with a fresh impetus. Their impact was immediate and Thistle took the lead shortly after the hour mark when Craig Slater’s corner wasn’t cleared by the Fifers, allowing Steven Anderson to nod home. It was tough on East Fife but they responded well and had chances of their own to get level. The best came late in the match when Anton Dowds whipped a dangerous cross into the box which Jonny Court missed by no more than a couple of inches. It was the visitors who held on, though, and the Fifers departed the tournament. There was disappointment around Bayview - but attention now turns to Friday night’s Irn-Bru Cup semi final in Dingwall. Boss Darren Young said: “It’s just disappointing that we lost a goal from a set-piece when we were on top. “You need to take your chances, because if you don’t then you get punished and Stevie Anderson did that. “It’s something we highlighted to make sure they don’t get any opportunities. “But apart from that they maybe only had one or maybe two chances and that was it. “We did great and I can’t ask any more.